Discuss the benefits in the design and specification for natural stone fabricated and installed through the adoption of precision digital technology. Define new standards developed to measure, document, and verify efficient, sustainable practices throughout the life cycle of natural stone. 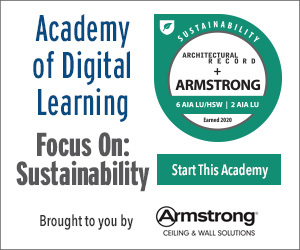 Identify key considerations in the selection, design, and specification of natural dimension stone to maximize performance, durability, and sustainability. Explore innovative examples of natural stone used for its functional and artistic potential in buildings and landscapes around the country. For more than 30 years, Sidney Hornstein, a geologist and environmental educator emeritus at the American Museum of Natural History, has provided tours for architects to walk through time by visiting some of Manhattan’s iconic stone buildings and parks.1 This tour of building stones in lobbies, on facades, sidewalks, and curbs provides a trip through time and across the globe. He identifies rock varieties from North America, Europe, Asia, South America, and Africa ranging in age from 1 to 3 billion years. From Rockefeller Center to the Empire State Building, these permanent icons of the city were also expressions of geological history. Natural stone used in buildings provides a record of prehistoric events and connects humans to the natural world. 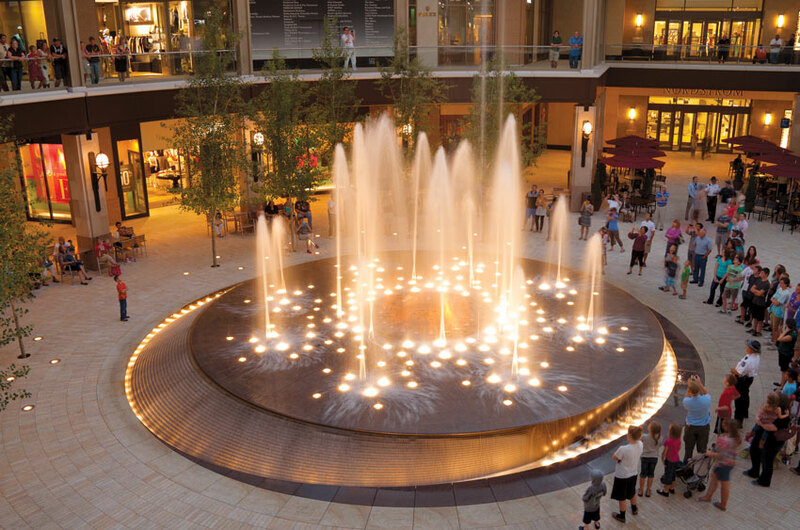 New digital fabrication techniques allow the eruption of fire and water from this natural stone fountain at City Creek Center in Salt Lake City. The stone manufacturer meticulously fabricated a total of 176 perfectly positioned holes for water jets and light fixtures and 49 holes for gas-fueled fire nozzles, providing the exacting precision required for this dramatic public space. The authenticity of a material has been a hot topic of aesthetic research and discussions from the beginning of the Industrial Age through the Modern era. In the “Seven Lamps of Architecture,” John Ruskin argues for material structural and functional purity. This document and others were the basis of continued design initiatives by Modernists and others to choose materials that were not imitations of the original material. When used as a contemporary cladding and not a structural system, natural stone retains its original unique characteristics. No two stones are alike, and the variations provide a wealth of creative opportunities. In order to provide a change of light reflectance on buildings, walkways, and other exteriors, a monolithic surface needs to be manipulated. The surface of natural stone can be varied to change its characteristics. For example, granite may both sparkle in the sunshine or provide a mirror reflection of its surroundings. Whether specified for a building facade or for exterior stairs, ramps, walls, fountains, and walkways, the performance, permanence, durability, versatility, resiliency, and beauty make stone a primary construction material for buildings and landscape applications that are meant to last for centuries when specified correctly. Natural stone provides a connection to the environment and a history of human construction. This material is timeless and chosen by architects for buildings meant to last for centuries. Granite, limestone, marble, onyx, quartzite, sandstone, serpentine, slate, soapstone, and travertine are just some of the natural stones used in buildings. Granite (from the Latin granum, or grain, signifying its characteristic structure), an igneous rock, was formed billions of years ago when magma cooled deep beneath the earth’s crust. Nearly as durable as diamond, granite owes its density and hardness to its origins, solidified deep within the earth under extreme pressure. Marble (and its wildly varying relatives: travertine, limestone, and onyx) is a metamorphic form of limestone. Granite is a hard rock suitable for use on exteriors for paving, walls, and building exteriors. Marble was formed when sediment and other materials forged together beneath the weight of heavy bodies of water. After millions of years, these crystallized minerals resulted in a natural stone that is typically white with streaks of color, capable of taking a hard polish. Different types of stone can be used for different applications depending on the technical properties and the applied use on a building interior, exterior, or landscape areas. All natural stone is classified as a nonflammable, Class A building material, and design professionals examine technical properties such as the natural stone’s water absorption, compressive strength, and frost resistance before selecting a type of stone for their project. There are many misconceptions about the use of natural stone. Architects may avoid this material if they feel that their creativity will be limited when using natural stone in contemporary design. This happens if they don’t realize that this product can be used when designing complex geometric shapes. The following examples are proof that today’s architects are applying natural stone in creative and inventive designs because of new digital advances in the stone industry as well as the timeless beauty inherent in this natural material. These architects, landscape architects and artists, are exploring the value of using various finishes and new fabrication technologies to achieve their aesthetic objectives. The following case studies demonstrate the many benefits of using natural stone as well as the new and creative ways that technology continues to enhance the way stone can be used.